The SR PS24-2A is a high performance DC switching power supply that provides a 24 VDC 2 Amp source or DC powering for multiple In-Line Amplifiers and other Active devices on Excessively long Drop Cables (must calculate DC loop resistance and Voltage drop to qualify use, do not use on under rated devices). It utilizes a rugged 18AWG cord, RFI filtering and low resistance DC cord, with an AC cord that can withstand a 300-volt surge. An SR PS24-2A powers any SR product for DIRECTV MFH2 technology, including the SR TA6AL amplifier, SR 6SPI power inserter, SR FMC-2 chassis as well as up to two (2) SWM8 modules. 12 ft. reach can be extended by connecting RG6 via F connector connection from F-81 connector at the end of the Power Supply cord. 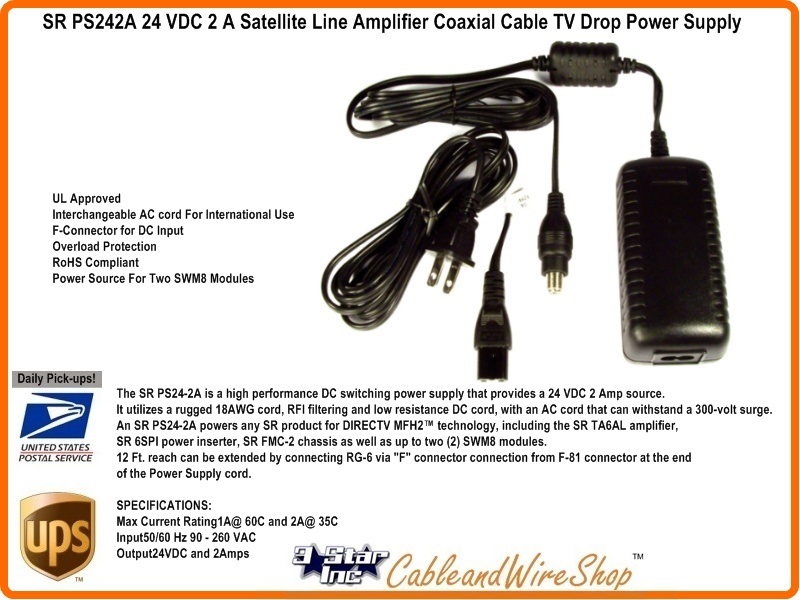 Note: When Splitting the High Frequencies of Satellite TV Services to feed multiple Receivers, the Loss associat3ed with the Splitter May need to be compensated for with the use of an Inline Satellite Drop Amplifier specific to this purpose and Frequency Range.